For my anniversary, my husband bought me pearl earrings. Pretty dangly ones. 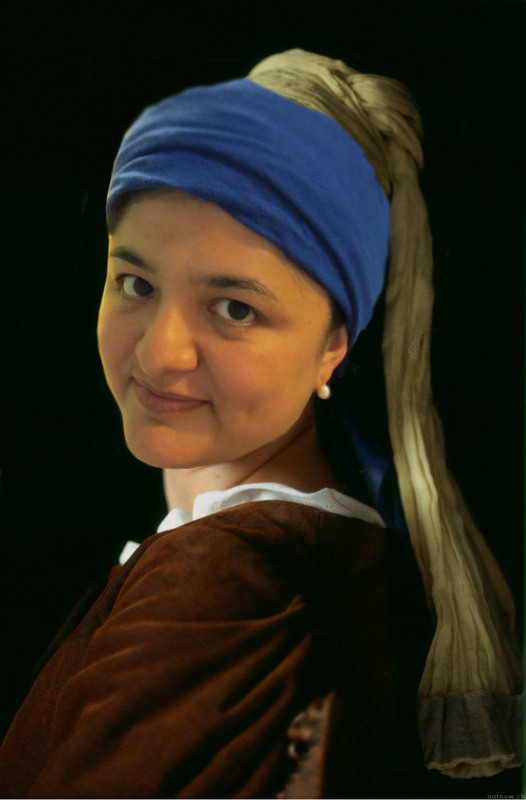 And as I put them on this morning they reminded me of one of my favorite paintings, Vermeer's "Girl with a Pearl Earring". So, having a little fun with Photoshop, I took a photo of myself with a blue pillowcase wrapped around my head and put myself in the painting. Now, I really feel like a work of art! Excellent work on the portrait. I can learn from the photoshop concept that you did here. This is actually a good photo. What camera did you use in taking a self portrait? I can't see too much noise on the image. You did a great job in editing the photo using photoshop.